Characteristics: The site is an old gravel excavation area, on the left bank of the Moselle River. 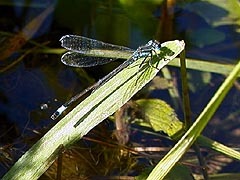 The site consists of several small to large ponds and lakes, all varying in depth. These drained lakes in Remerschen are part of a natural reserve where you can watch rare species of birds. Important: There is only one lake where water sports are allowed! 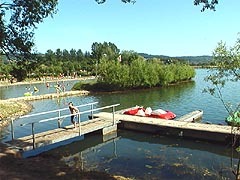 Main site: In this recreation and sports area, located beside the Moselle, 2 lakes are reserved for the public. One is reserved for fishing (licence compulsory on sale at the lake) and the other is intended for watersports like swimming, diving, windsurfing, canoeing, pedalos etc. Maximum depth: The depth of the main public lake is 4-5 m. Rainfall is the main source of water supply. Flooding of the Moselle River also contributes to higher water levels, but not in a major way as the site is located somewhat higher than the Moselle, and the two are not in direct contact. Visibility: The visibility is quite reduced in the lake, about 1 m in average. After long rain periodes the visibility can alter to less then 1 m, then diving becomes not very interesting. Notice: Some Luxembourg Red List species can be found at the site. 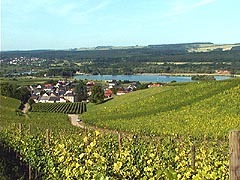 Wine tasting: The mild, sunny climate of the Moselle is ideal for wine-making. White wines such as Riesling, Rivaner and Elbling are the most popular. Top quality wines are labelled Grand Premier Cru. Wine cellars are happy to receive visitors. For further information, contact the Luxembourg National Tourist Board.